In the middle of April 2015, the company MOL Katalysatortechnik GmbH, in the swimming baths in the city of Merseburg in the eastern German region of Saxony Anhalt, handed over one of the world's most modern shower-circuit cleaning plants to the City of Merseburg for cost-free further use, after several years of use on a rental basis. The plant's purification process is based on an environmentally friendly process that was developed by employees of MOL Katalysatortechnik GmbH in Merseburg and has now become a global export hit as an innovative product from Saxony Anhalt. Sometimes the search for solutions to a particular problem leads scientists to findings that unexpectedly open up new application possibilities. Something like this happened to Dr. Jürgen Koppe, Managing Director of MOL Katalysator GmbH, while he, together with Dr. Hartmut Lausch, Dr. Ulrich Heubner and Wilfried R. Herda, searched for over two decades for environmentally friendly alternatives to exhaust-gas catalysts containing platinum. During this search they discovered nickel-chromium-iron alloys that form crystalline structures – so-called spinels – on the surface. These alloys turned out to possess catalytic properties. This means that the material involved in the chemical reactions is not used up. It is, in a way, as if one were to mix a spoonful of butter into powdered potato dissolved in water, and then, after boiling up, end up with delicious potato mash and get back the butter intact. The chemical industry knows a large number of such catalysts for various applications. The solid body catalyser developed by scientists from Schkopau proved to be particularly suitable for environmentally friendly water purification. In the presence of the catalyst sheets, the microorganisms present in the water, such as amoebae, bacteria and fungi, are deprived of their protective and reproductive space – the biofilm. This biofilm-dissolving effect is brought about by the formation of so-called “biosurfactants”, which are formed in the MOL®LIK process on the catalyst surface from water, a little daylight and residue of dead bacteria. In the older MOL®CLEAN process, the biosurfactants are formed on the catalyst surface of living bacteria and a little hydrogen peroxide. The biosurfactants are organic substances with detergent-like properties which cause the disintegration of even stubborn bacterial deposits on material surfaces (pipes, heat exchangers). “The MOL®CLEAN process that we first developed proved – due to the very low concentrations of hydrogen peroxide concentrations − proved to be environmentally friendly and corrosion-reducing, which is in absolute contrast to other biocidal processes which use larger quantities of chlorine, hypochlorite and chlorine dioxide or energy-intensive UV lamps”, says Dr. Koppe. In the middle of 2006, thanks to cooperation with the company AquaMOL, the new technology from Saxony Anhalt received its first international application in a petrochemical plant in the central Volga region. In the piping systems for the transportation and processing of crude oil, it is not unusual for organic substances to build up on the walls of the pipes, which can impair the flow of crude oil. Particularly feared are the so-called biofilms, a bacterial community that is especially difficult to destroy. With the MOL®CLEAN process it is possible to loosen the stubborn layers of slime despite less use of chemical oxidants. In addition to positive environmental effects, MOL®CLEAN also causes a lower rate of corrosion in the pipes. The modern purification process from the researchers from Saxony Anhalt thus also pays off economically due to lower servicing and maintenance costs. The petrochemical industry was not to remain the only area of application. Biofilms are an almost universal problem, e.g. on shower heads, in standing water pipes and air-conditioning systems, on medical implants and false teeth. 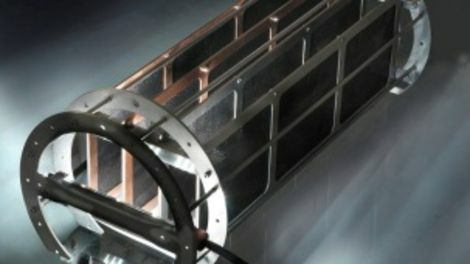 MOL catalysers are now successfully in use in Germany in, among other places, dozens of swimming baths, in the air-conditioning systems of printing plants and broadcasting companies, in museums and theatres and in the cold water circuits of power stations, on car painting lines, in the cooling systems of pharmaceutical companies and for the renovation of the 16 kilometre-long drainage channel of the Ruhleben sewage works in the Teltow Canal. Within a few years the environmentally-friendly and economical catalyser purification technology has become an export hit from Saxony Anhalt. The MOL solid body catalysers are now in operation in more than two dozen countries on almost every continent. It is well known that nothing is so good that it cannot be improved. Through coincidence, a high-school graduate, who is now an employee of MOL Katalysatortechnik GmbH, discovered a few years ago that similar effects can be produced just by the interaction of water, low-energy visible light and residue of dead bacteria. Because neither biocides nor living bacteria are required for this, this is a biocide-free process. The new variant is called the MOL®LIK process. This process does entirely get along without the addition of biocides/oxidants or energy-intensive UV lamps. There are no undesirable side-effects for humans or nature. Daylight or an energy-saving LED lamp is enough sufficient to keep water-conveying pipes and systems free of biofilm. In comparison to the use of UV lamps, the substantially lower energy consumption (five Watts compared with 1,000 Watts with UV lamps) is a significant financial advantage. In September 2014, MOL Katalysatortechnik GmbH was given the award of the Saxony Anhalt Environmental Alliance. MOL Katalysatortechnik GmbH is supporting the University of Applied Sciences of Merseburg in its entry in the regional competition BESTFORM, in which an award is given for the best possible cooperation between creative people and partners from other branches of industry. Dr. Koppe would be neither a good scientist nor an innovative managing director if he were not to have, for a long time, already been considering other areas of application, such as e.g. the central water supplies in hospitals, sanitaria, old people’s homes, hotels and dentists practices. A useful contribution to the global protection of the environment and health could also be the disinfection of ballast water carried on sea-going vessels and the purification of drinking water in developing countries. “In the middle of July, representatives of an Indian company, will be finding out about the technology in a visit to Germany”, says Dr. Koppe.